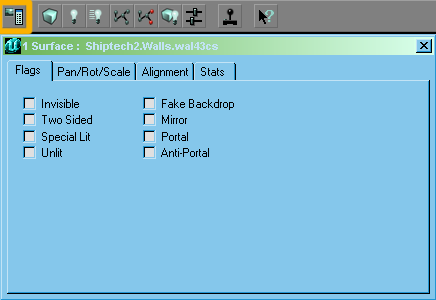 Difference between revisions of "Legacy:Surface Properties Window"
This is a floating window that sets properties, shows stats and allows texture alignment for surfaces. If no surfaces are selected, the window is blank. It updates automatically when the selection is changed: see Selecting surfaces for more on this. The window title bar displays the number of currently selected surfaces, and if they all have the same texture, its full reference: package, group and name. The window has four tabs. These affect the how the texture is displayed on the polygon. UnrealEd 2's version of this tab had many more flags: see Surface Flags (UT) for those. This tab allows you to change the way the texture is aligned on the surface. 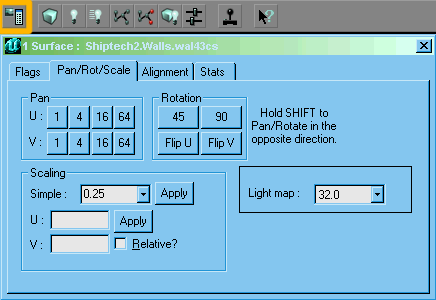 The Lightmap box sets the resolution of the lightmap on the surface. Default is 32, higher numbers save on map file size. See Map Optimization. This is covered on Surface Alignment. Gives info about Light (UT)s and Meshes. Does anyone ever look at this bit? Last modified at 14:02, 11 December 2015.